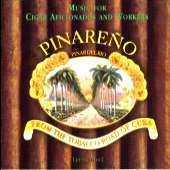 Various - "Pinareno - The original sound from the Tobacco Road of Cuba"
The crop of 1989: These field recordings, taped by Finnish musicologists, reflect the genuine sound of the Pinar Del Rio province in western Cuba. This rural paradise, far from the urban centres of Havana and Santiago, where musicians, cigar factory workers and labourers stroll under the shade of the tobacco plantations, has managed to keep the classical Cuban styles such as Bolero, Danzon and Guaracha-Son intact. The Pinareno All Stars - Authentic, earthy, good. Tobacco fields forever!